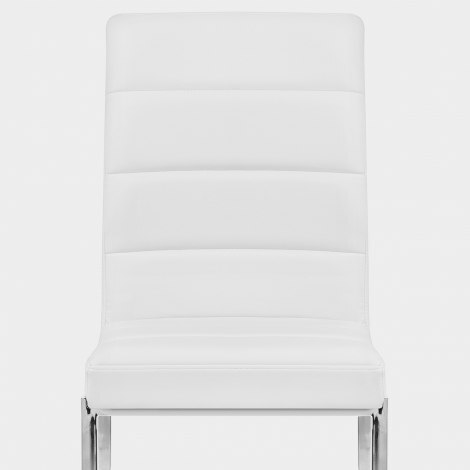 Tempt yourself with the Taurus Dining Chair White, a minimalist treat for the kitchen or dining room table. Sure to be a success in every setting, the Taurus is worth taking a chance on, with its super supportive style and decorative detailing. The segregated styling of the faux-leather seat provides it with its trademark finesse. And, its white colour will fit perfectly in a range of spaces. A set of four polished chrome legs supports the Taurus, providing it with strong foundations to suit the item's uncompromising reputation. "Comfy, sturdy, strong and look great too"
Beautiful chairs very easy to put together and very good quality. Everything about my order from Atlantic was perfect. The chair is amazing quality and they provide everything you need in order to assemble it. I'm very pleased. I ordered the wrong chairs, and although these were very nice they were the wrong size. Atlantic Shopping were fantastic when it came to changing them for the correct ones which were delivered really quickly, easy to assemble and looked great. Also very comfortable to sit on and so I am more than happy with Atlantic Shopping and my fabulous new chairs. Very speedy delivery. This was our third chair we bought from them. It is very comfortable and beautiful. Very reliable services. We were quite impressed getting our chairs the following day of ordering. They looked nice and easy to assemble. We might need the forth one soon.